Who is Big Hero 6? After the massive success of Marvel’s Guardians of the Galaxy (still in the top ten after over two months in the theaters) we have another movie about to hit the big screen. This time Disney is bringing its animation unit into play for the adventures of Big Hero 6! But who is this group of superheros that will be coming to us November 7, and why bring them to the screen? It goes back to shortly after Disney’s acquisition of Marvel in 2009. CEO Bob Iger encouraged his film division to look at the many possibilities within the Marvel Universe for possible adaption projects. Don Hall, director at the time for Winnie the Pooh, came across a comic he wasn’t familiar with and decided to pitch the idea to John Lasseter. Lasseter was intrigued by the idea saying it “struck a chord” so by June of 2012, an animated adaption of Big Hero 6 was announced. In 1998, Marvel decided to do a comic with Manga-style artwork. According to the storyline, the Japanese government wanted to have a team of superheros for the defense of their country. They would be state sanctioned and were brought together by a secret consortium of politicians and business leaders know as the Giri. The first member of the team was the freelance ronin and former bodyguard of the terrorist Viper known as the Silver Samurai. There were of course reservations in setting this former “villian” as the team leader, but his loyalties have always been deeply rooted in his love of country. Next to join was an inventor and secret agent Honey Lemon who used a Power Purse of her own invention, using nanotechnology, from which she could access any object (think the high-tech version of Mary Poppins carpet bag). 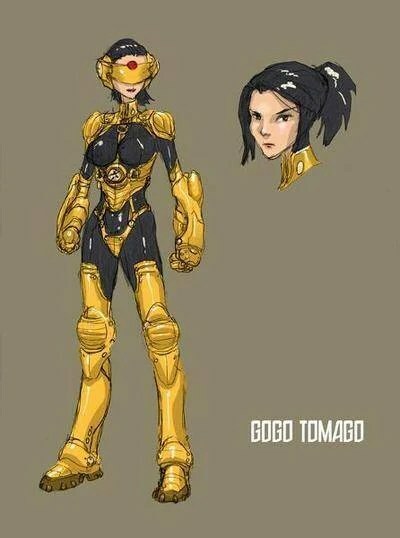 Then they added GoGo Tomago whose tough-talking prisoner status could have precluded their entry. But she agreed to serve on the team in exchange for her release, and her ability to change her body into a fiery force blast by speaking her code-name. They then settled on a bureaucrat whose would be best termed as Machiavellian, Mr. Oshima became the team’s spokesperson to the Giri and activity coordinator. Giri then looked at having another inventive genius join the team. They approached a young teen by the name of Hiro Takachiho to join, but he declined. Hiro did join the team when his mother was kidnapped by the villian Everwraith who is the astral manifestation of all those killed in the World War II era nuclear attacks on Hiroshima and Nagasaki. To help him in his quest for his mother (and justice) Hiro creates a synthetic bodyguard named Baymax using the engrams of his deceased father. As Everwraith threatened to kill millions of people in downtown Tokyo, the team came together, along with the premiere Japanese super-hero and former member of the X-Men Sunfire. His power is to super-heat matter into plasma that he can throw or project from his hands. It was this group of six heroes who defeated Everwraith. After their first adventure as Japan’s answer to The Avengers, the team decided to relocate from the Giri Office Building (probably a smart move for the corporations insurance policy) to the Cool World Amusement Park. But the move brought them face to face with X the Unknowable, a monster spawned from a child’s drawing that that could manipulate its atomic structure to any shape or form. This foe was ended when it was forced into the fires of Japan’s Mount Fuji. Next came an attack using a freak blizzard in Tokyo caused by the Crimson Cowl and her Masters of Evil. Sunfire left the group to work with the Charles Xavier X-Corporation in their India offices. He was replace with a similarly powered young woman named Sunpyre. Sunpyre came to the group via Honey Lemon’s Power Purse. In fact, Sunpyre seems to regard Lemon as her own personal god after her arrival in this reality. Silver Samurai also left the team, but this time under less happy occurrences. In a non-Big Hero 6 story, he was supposedly killed by the the world-class assassin Elektra. This void was filled by a new samurai… the Ebon Samurai. It was at this time with the senior (ie – experienced) members of the team gone that Hiro became the new leader of Big Hero 6. 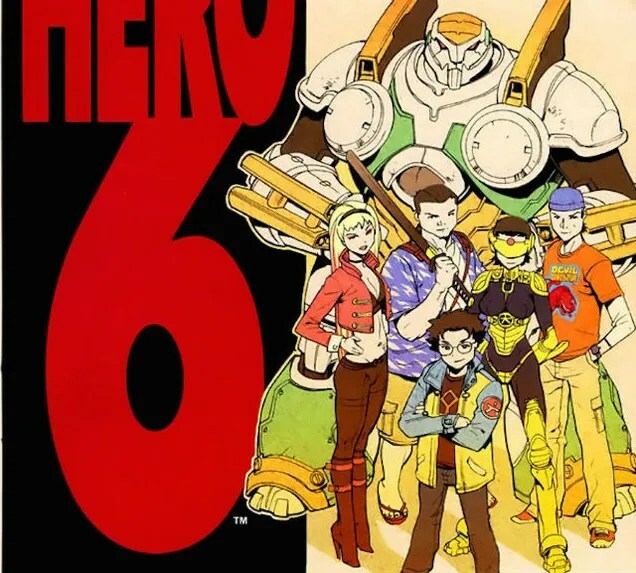 During this grouping within Big Hero 6, the team was faced with the menace of Yandroth. This is an interesting passage in the groups career as they are confronted by a team of Living Erasers, which can transport people from their reality. The battle is being used as a method to gain powers (and other teams are mentioned in passing being similarly attacked) but the whole battle takes place off panel! Big Hero 6 was next seen in another mini-series that had them mind-controlled by a device that had been planted in Baymax. They traveled to Canada where they went into battle with that country’s super-hero team Alpha Flight. During the battle the device short-circuits and the teams part as friends. But who had planted the device in the first place… Spider-Man next contacted the team to help him in the epic Ends of the Earth storyline to defeat Octopus. Even after defeating the so-called Octobots they find their old nemesis Everwraith is the final line of defense for the facility. They of course are victorious. In the upcoming movie we will see a change in the line-up of the team. We still have Hiro Hamada, Baymax, Honey Lemon and GoGo Tamago. As in the later comic stories they are joined by a couple of new members. First up is Wasabi-No-Ginger, a trained chef who uses various swords as his weapons as well as throwing knives formed from his Qi-Energy and they cause paralysis. The final new member is simply known as Fred, who can transform himself into a Godzilla-like creature. This is the Big Hero 6 that we will see in their home town of San Fransokyo… a mashup of the cities San Francisco and Tokyo. Big Hero 6… coming to a theater near you November 7!